mmsonline.com November 2017 MMS 153 FABTECH 2017 November 6 - 9 from other industrial processes, material, e q u i p m e n t a n d p e opl e, w hil e still enabling access to them. The door is installed with exist- ing machine guard panels on each side o f t h e d o o r. I t i s designed with high- speed capability to minimize cycle time and maximize pro- d u c t i o n i n a u t o - mated environments. Applications include auto- mated production and machine processes that require preventive measures, such as robotic welding, processing and transport tasks. It can contain process-generated hazards, such as light debris, fluid splatter or mist, weld smoke, sparks, and intense flash. The durable design enables safe operator interaction, high-speed operation and long life. 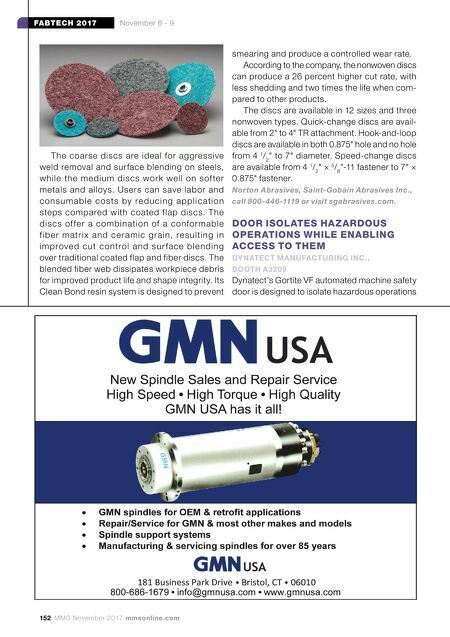 Dynatect Manufacturing Inc., call 800-298-2066 or visit dynatect.com. 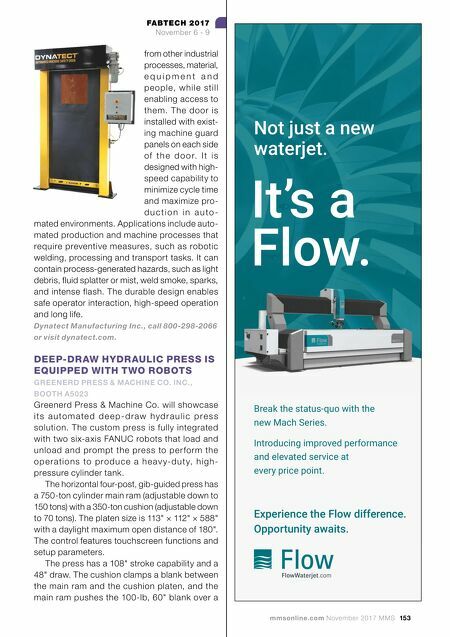 DEEP-DRAW HYDRAULIC PRESS IS EQUIPPED WITH TWO ROBOTS GREENERD PRESS & MACHINE CO. INC., BOOTH A5023 Greenerd Press & Machine Co. will showcase i t s a u to m a t e d d e e p - d r a w h y d r a u l i c p r e s s solution. The custom press is fully integrated with two six-axis FANUC robots that load and unload and prompt the press to per form the o p e r a ti o n s to p ro d u c e a h e av y- d u t y, h i g h - pressure cylinder tank. The horizontal four-post, gib-guided press has a 750-ton cylinder main ram (adjustable down to 150 tons) with a 350-ton cushion (adjustable down to 70 tons). The platen size is 113" × 112" × 588" with a daylight maximum open distance of 180". The control features touchscreen functions and setup parameters. The press has a 108" stroke capability and a 48" draw. The cushion clamps a blank between the main ram and the cushion platen, and the main ram pushes the 100-lb, 60" blank over a Not just a new waterjet. Break the status-quo with the new Mach Series. Introducing improved performance and elevated service at every price point. Experience the Flow difference. Opportunity awaits. It's a Flow.